Notice: On January 20, 2016, the name of this weblog was changed from “Stop the Schenectady Casino” to “snowmen at the gates“, to underscore its returning to its original broader focus on local and neighborhood issues. [Our original name in 2010 was “Save Our Stockade Trees.”] See the statement of Our Name & Mission for an explanation. All prior materials have been retained and old links will be redirected. In our home-page Sidebar you will find a list of recent postings, and pull-down menus for Archives and Categories. Thanks for your patience. Naturally, we apologize for any confusion or inconvenience. Our Header Image. The image used in our Header since January 2016 corresponds with the new name “snowmen at the gates,” and depicts the event that inspired the name. It was cropped from the hand-colored image on the right, and is from the collection of North Wind Picture Archives. The original black/white woodcut in North Wind’s archive is a “conjectural” illustration from a four-volume work by William Cullen Bryant and Sydney Howard Gay, “A Popular History of the United States, from the First Discovery of the Western Hemisphere by the Northmen, to the End of the Civil War” (New York: Charles Scribner’s Sons, c1876-1881). Its original caption read: “The Attack on Schenectady.” We assume the original artist was an in-house illustrator for Scriber’s. The hand coloring was done by North Wind’s archivist, Nancy Carter. 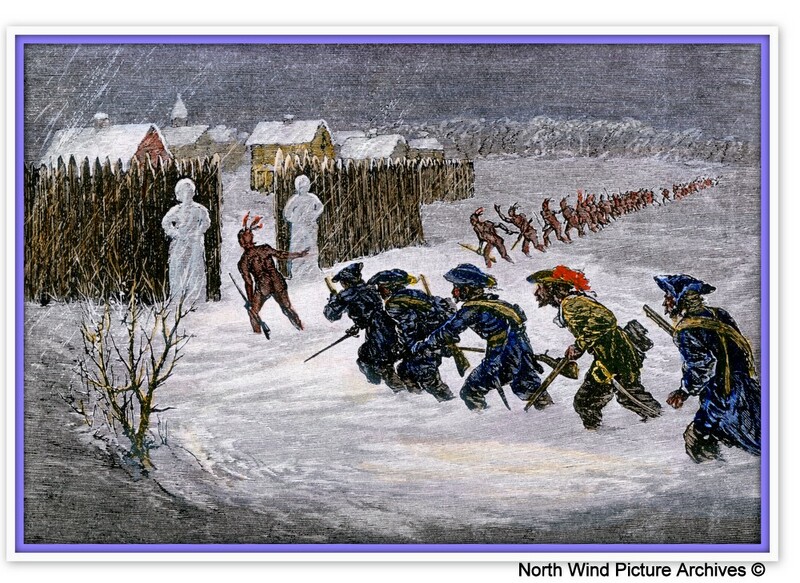 The image depicts the Schenectady Stockade on February 8, 1690, with the north gate stuck open due to high snow, and with two snowmen as the only “sentinels.” [The appointed guards were apparently in the nearby pub, enjoying the warm fire and ale.] French Canadian soldiers and Sault and Algonquin Indians are seen about to enter the open gate to perpetrate the Schenectady Massacre of 1690. (The woodcut presents the pre-20th Century image of American Indians. The actual Indians, who had marched for days in deep snow from Montreal, would certainly have been more appropriately dressed and worn snowshoes of some kind.) We have fleshed out the Massacre Snowmen story more, looking at a few notable historic sources, in “have we learned the lessons of the 1690 Schenectady Massacre?“.
. . . David Giacalone is the proprietor/editor of this weblog, and responsible for the contents of each posting, unless otherwise noted. He has lived in the Schenectady Stockade since 1988. David is also the Editor and photographer for the non-commercial weblog suns along the Mohawk, which features pictures of “sunsets and sundries” (such as ice jams, Valentine flamingos, art shows, photobooks, and lots more) from the Schenectady Stockade and the Schenectady banks of the Mohawk River. 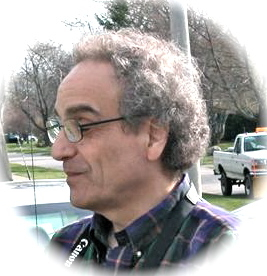 A retired divorce mediator and former children’s (and antitrust) lawyer, David also hosted the award-winning weblog f/k/a, from 2003 to 2009. The site, which is still available online, featured commentary on legal ethics and clients’ rights, punditry on many social and cultural issues, and haiku by two dozen of the finest English-language haiku poets. Despite impressions to the contrary, David strongly prefers schmoozing with friends and neighbors, taking and posting photographs, and playing bocce, Skip-Bo and Scrabble, to complaining about government and community leaders who seem to forget why they hold their positions. 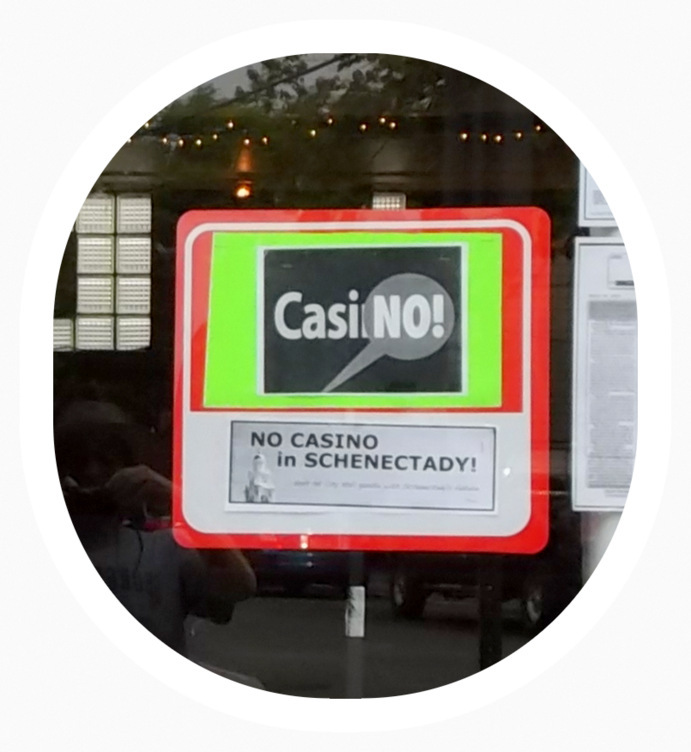 This weblog was renamed “Stop the Schenectady Casino” on June 1, 2014, as part of a campaign by people throughout Schenectady and nearby communities to Stop the Schenectady Casino proposal. We hope to compile materials useful in understanding the overall negative effects of having an urban casino, especially in Schenectady and so near the historic Stockade residential neighborhood, and to fight its choice for a casino license. Please don’t believe those who have pretended that Stop the Schenectady Casino is/was a campaign focused solely on the parochial interests of a few residents of the Historic Stockade District. Most of the people who worked actively on this campaign and signed our Petition live outside the Stockade. More important, our concerns were many and deep, and our research and advocacy filled a hole in local coverage that was much needed, even if ignored by the Schenectady Gazette. (see, e.g., , “five major reasons for opposing the Schenectady casino“, and our 20-page Statement in Opposition to the Schenectady Casino). update (December 2014): As can be seen from the changes made to our masthead after the Location Board selection of the Schenectady location, we believe there is much to be done to protect our community from the very real threat of casino-made problems. We hope people of good will on all sides of the casino selection issue will cooperate to find effective solutions in the two years we have until a casino is in operation. This weblog is being rushed into service and David Giacalone, the Editor/Proprietor, simply has not had time yet to compose a comprehensive About page. See the Home Page for a brief mission statement, and see our first posting concerning Washington Avenue to see the initial impetus for this site. David Giacalone has lived in the Schenectady Stockade since 1988. 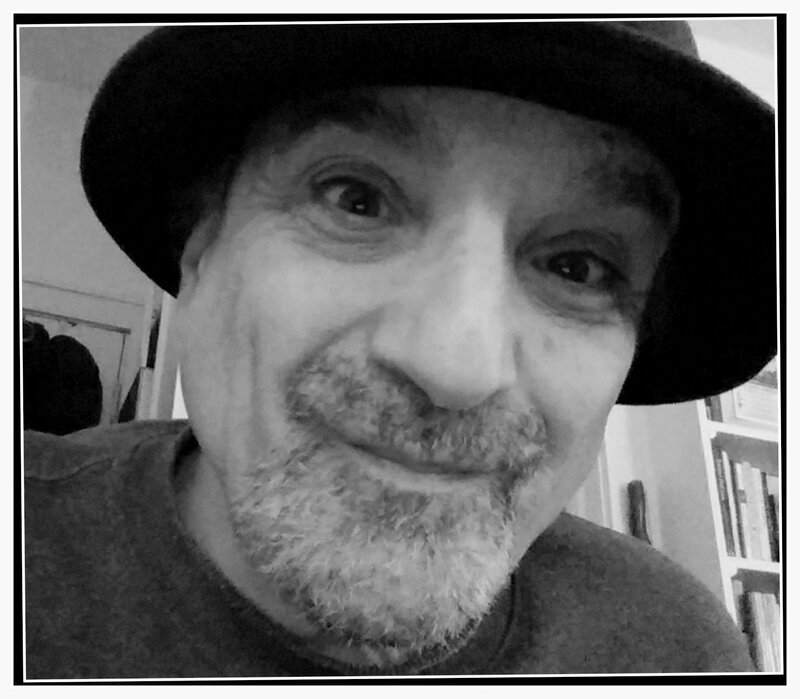 He is the Editor and photographer for the weblog suns along the Mohawk, which features pictures of “sunsets and sundries” (like ice jams, plastic Valentine flamingos, art shows, and lots more) from the Schenectady Stockade. From 2003 to 2009, he also hosted the award-winning weblog f/k/a, which offered commentary on legal ethics and clients’ rights, and presented haiku by two dozen of the finest English-language haiku poets. COPYRIGHT POLICY: The content of this website is presented under a Creative Commons Attribution-Noncommercial-Share Alike license. That means you may share its content for noncommercial purposes, so long as you attribute it to David Giacalone and the weblog “snowmen at the gates.com,” and distribute any resulting adaptation of the work only under the same or similar license. [details] No other use (beyond your limited Fair Use rights) may be made of the content of this weblog without permission from David Giacalone, the copyright holder. Email him at davidgiacalone AT gmail DOT com (convert to a usable address by substituting the “@” and “.” in the appropriate places, with no spaces). please take a look at this report about the impacts of local casinos on the host communities. The landlords group SLIC is discussing the Casino proposal tomorrow night at 6:30 during our regular scheduled meeting. You are welcomed to join us. We have to move faster before the next Council meeting on Monday. Do u have any other scheduled events? Thank you for getting in touch, Mohamed. I am glad you are speaking out and organizing activity on this topic. I will contact you directly this morning. Hello David, I enjoyed meeting you when I was in the Stockade last month. As I mentioned, I may be moving there one of these days. As I also mentioned, I have a blog that is relevant: https://thecommissionersformanagingtheindianaffairsatalbany.wordpress.com It may seem a little dry and academic at this point, but it will evolve. Be well! hello, Ann. Thank you for stopping by and reminding me to delve into your website. I also enjoyed meeting you on Cucumber Alley, and hope you’ll decide to make the Stockade your home. Is there a posting at your website that explains the purpose of the Indian Commission and how it operated? Thank you, Ann, for your speedy reply. I will check them out as soon as I finish e-mail consoling of friends traumatized by the Presidential election results. Of course, that could take a while. Consoling takes precedence today. And yes, thanks, I need to do that. Hello, Mori. I am about to send you an email to keep this reply private. Before you comment on the fireworks at Rivers Casino you should do some better background work. The casino provided a safe and great event for the city! The bike path and riverfront are all accessible to anyone. The fireworks both nights had a fenced in safe area for any one to watch, for free. One did not have to worry about their children running off and also provided rest room facilities. Oh course someone as narrow minded as you will not even consider anyone else’s thoughts or FACTS…..how sad I feel sorry for you. Thank you Ruch street and Rivers Casino for the great American celebration! Mr. Gill, There’s nothing like a hateful personal attack, filled with misperceptions, to get me to stop a moment to reply. As for the riverfront, I did and do oppose Rush Street pressing our City Council to remove the guarantee of true public access and enjoyment of the riverbank. The public will be able to use the bike path, but must keep on moving, and cannot sit along the riverbank itself, unless they are customers of Mohawk Harbor and the Casino; and, at places, buildings are constructed right on the riverbank, making it impossible to “enjoy” it as a member of the public. On July 4th, you had to be an invited Rush Rewards member to be on the Patio at Mohawk Harbor, unlike at Rush Street’s Pittsburgh casino, with its large, truly public amphitheater. I am pretty good about getting the facts. Don’t feel too sorry for me, at least I was not spewing hateful comments on a Monday morning. If you would like me to remove this Comment of yours to preserve your reputation, please let me know. Otherwise, it will be here enlightening our readers and anyone googling your name far into this century.